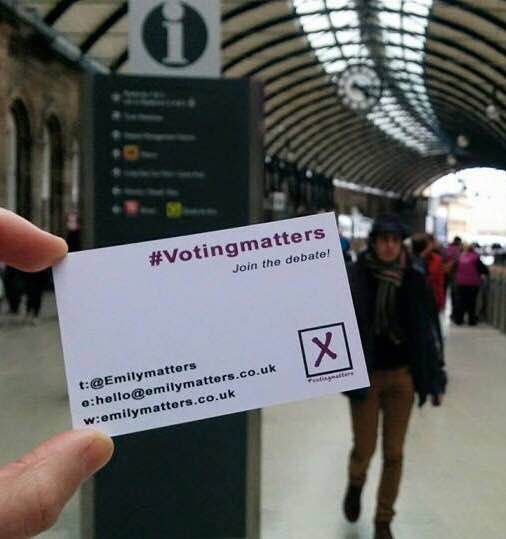 #emilymatters because when I tell people I'm studying political science they look me up and down and say "what's the point in that?" Or my personal favourite "where's that going to get you?" As if just because I'm a woman from a working class family I have no use or purpose in the political world when in reality politics is involved in everything, right down to their reasoning for limiting me based on my background. #emilymatters because after seeing Teresa May present an incredible argument in Parliament I could not wait to see the positive press she would receive the next day, only to see articles about the inappropriate colour of her suit with not a single mention of her strength and power the day before. #emilymatters because when I was a child I was continuously called "bossy" because I always had my own opinion and I knew how to voice it. I was called "bossy" or "loud" because I loved to be the director of the shows we could put on and refused to be told what to do. If I didn't want to do something I couldn't be forced into it. In everybody's eyes, except my Momma's, this was a negative thing. Thankfully my Mom instilled it in me that it's something to be proud of, a confidence boost that stayed with me and that has quite genuinely motivated me for the whole of my life. It's so important that this education begins in the home, I was just so lucky to have never been without it. I recently witnessed a young boy at my place of work saying that "all girls are bossy, they should just do whatever boys tell them to." The fact that this isn't a rare occurrence for me to come across at work clearly displays the need for education that this is never okay to think and the empowerment of young girls to be noticed by both boys and girls as "leaders" and "confident" people is a prime example of why #emilymatters. #emilymatters because people ask me whether I have a boyfriend before they ask me what my aspirations are. Yet my brother is always asked "how's college?" Or "any idea what you want to do at uni yet?" But if we ignore our genders we are both very academic students with a thirst for change and the desire to be part of that change in anyway possible. So why should the difference in the way I'm approached and spoke to be based on the fact that I have a pair of breasts and a menstrual cycle? #emilymatters because people assume that I'm from a working class family so I must be a mad labour supporter and hate Thatcher. When actually the second assumption could not be further from the truth. Neither could people's belief that everything she ever did wrong in their eyes was because "she's a bird." Similarly, #emilymatters because I shouldn't have to tolerate being called "somebody's bird" or anybody's "other half" ever again in my living life. Ever. #emilymatters because I see a future when children ask "who are the suffragette's?" And "what did they even do?" But they will know the entire family history of the Kardashians and why they're famous. That still leaves a lot of Omega Seamaster Aqua Terra rolex replica models including those with the day and date (there are two types of those), the GMT, and the chronograph GMT (the models with rolex replica in-house movements). In this special feature article, we go on a quest to better understand what is behind the unremitting rise of luxury watch prices, and to do so, we will explore how and why Rolex prices have increased over the last 60 years. You see, while the rolex replica sale steep increase of high-end watch prices has become evident to every rolex replica sale discerning watch buyer on this planet, it remains difficult to point out exactly why and how things have changed so radically... or, if they have changed at all. This is, without a shadow of a doubt, one of the most pressing issues in the world of watches today, replica watches sale something that has raised countless questions and fueled numerous debates among watch enthusiasts, collectors, and experts alike.